In a dark moment I would describe many of the people in Hank Stuever’s wonderful new book as awful, and maybe they are and maybe they aren’t, but certainly they’re my opposite in every way — George Bush-lovin’, Jesus-worshipin’, Red State-occupyin’, exurbia-residin’ Texans. They say tomayta, I say tomahta. And so on. They belong to churches with horrible names like Celebration Covenant, where the sermons come with James Bond themes (“Church Royale 2007”). Their parties for friends require chocolate fountains. Their home decorations make Clark Griswold look Amish. They’ve lost the thread of the Iraq war, and ask what’s going on there now, but lose interest in the answer if it can’t be summed up on a bumper sticker. They’re the sort of people who swallow a radio station’s schmaltzy “Christmas Wish” sermonettes whole, and repay it with happy tears. And yet Stuever, a Washington Post reporter with whom I likely have a great deal more in common, embedded with these folks for an entire Christmas season (2006), returning for parts of two more, and somehow came to love them. He is a far better person than me, and certainly a more skillful journalist, because the book that came out of this experience — “Tinsel: A Search for America’s Christmas Present” — pulls off a neat trick, revealing every detail about the way three separate families (and many others) celebrate the holiday, without coming off as jeering or judgmental in any way. Stuever climbed every ladder with Tammie Parnell, an affluent mom with a seasonal business decorating others’ McMansions; he stood in Black Friday queues with Caroll Cavasos, a single mother with too much on her plate but a certain fragile optimism that Jesus is watching over her; and he served as official observer to the assemblage of Jeff and Bridgette Trykoski’s jaw-dropping, computer-controlled, music-synchronized Christmas light display, as well as the birth of Jeff’s consulting business as a holiday lighting engineer. You didn’t know there was such a niche in the working world? You’ve not been to Frisco, Texas, on the far-flung outer ring of Dallas-Fort Worth exurbia, where everything is new and newer and the discovery of a couple of inconvenient pioneer graves in the route of a new highway can barely slow the work down, let alone stop it. Or maybe you have, because there’s a Frisco everywhere, even in down-and-out states like Ohio or Michigan, spreading like kudzu, high-end malls popping up to serve the residents of all those 6,000-square-foot houses, along with megachurches and fast-casual taco restaurants, big-box stores and the usual accoutrements of affluent-white-folks culture. Parnell was my least favorite Tinselite, even while it’s clear she and Hank clicked as they decorated all those houses. That’s another paradox of upper-middle-class Christmas, outsourcing the hall-decking, but never mind that. Parnell has the eye and her clients don’t have the time, so let’s let her earn a tidy sum knocking herself out two months out of the year. But I cannot tell a lie: There’s a scene deep into the narrative, where Parnell goes searching for her “total moment” — that more-perfect-than-perfect holiday snapshot that children remember forever — and brings in a $150-an-hour fellow holiday entrepreneur named Cookie the Elf. This moment will leave you either helpless with laughter or sneering in contempt, and maybe both. It’s like this woman watched “National Lampoon’s Christmas Vacation” and came away with the idea the Griswold holiday would have been so much better if Cousin Eddie and his family had just stayed home. But probably you would end up liking her, because Stuever likes her, and Stuever makes her likable. She’s not a bad person, just one who has swallowed Christmas hook, line and tinsel. I think I chose her to channel my displeasure with a culture that never met a moral dilemma or conundrum that couldn’t be explained by an uplifting movie or self-help book (you want to know who buys Mitch Albom’s books? Umm…), that ultimately deals with the uncomfortable or painful by turning away. My heart did soften late in the narrative, when Caroll Cavasos suffers a personal tragedy and keeps her heart open and loving throughout. And it’s hard not to like the Trykoskis, cheerfully childless and still willing to turn their home into an experiment in how much a home electrical grid can bear, mainly for the intellectual challenge of its design. 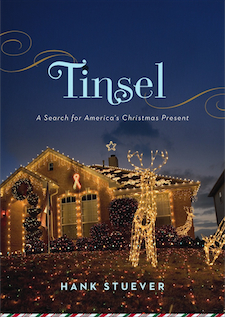 But it’s very easy to like “Tinsel,” and on behalf of the poor newspaper reporter who could use a fallback for the coming newspocalypse, I beseech you: Buy! You can always give it away for Christmas. Full disclosure: Hank and I are friends-who-have-never-met, he comments here on occasion, and yours truly is mentioned favorably on page 181. Not that such shameless flattery would ever sway my critical opinion, of course. Oh, and to the FTC: I got an advance reader’s copy free of charge. Buy the book via my Amazon store, making the cycle of kickbacks and corruption complete. I’m looking forward to reading Hank’s book. Sort of! Brian, I will be hanging at the convention center and library most of today, and may not have internet access again once I leave the hotel. Though if you walk into the convention center and start asking people for Connie O someone could probably find me. Or noonish by the reg desk in the convention center, I’ll check for you just in case. Connie – I will roll down there at lunchtime and see what’s what! If you’re at the Convention Center, then you have a great view of the rapidly rising hotel across the street (I always find it more than a little unsettling to see construction workers scurrying about in the open air, atop girders). Ah, the raid at Harper’s Ferry. Brian, did you know that John Brown’s first cousins were abolitionists in LaGrange County? Laura Brown was a teacher at the LaGrange Collegiate Institute and her brother was a physician. I need that eye exam stat. I thought they were the Trotskyites, not the Trykoskis. My sister collects Santa Claus stuff. I have a vacuformed plastic Santa Claus lamp that she would kill for. I’m not gonna let her have it. Now there’s a damn Christmas story. Alex – that is amazing. Speaking of abolitionism, it is interesting that for as much as America loves conspiracies and conspiracy theories, scholars have only recently begun expending ink on the web of connections – mostly financial, but also conceptually and operationally – between John Brown (who really was a violent lunatic) and first-rank abolitionists such as Frederick Douglass and “Beecher Bibles” in Kansas. I’ve only read a few things about the UGRR – just enough to get an idea that the term refers more to an ill-defined cultural impulse, rather than a unified, tangible thing. Similarly, it seems that the word “abolitionist” was mostly a scornful term at the time, and seems to gain a little more glitter with each passing generation, until now many people would like to think they’d have been a real-live “abolitionist” when in fact they would never have been any such thing. The interesting thing about the UGRR is that cowardly little people like me could lend a hand here or there, when the opportunity arose – or turn their heads away, as if nothing was happening. BTW – I visited the Illinois State Museum for the first time this past weekend, and was thunderstruck by a very simple, beautiful display. They have a very nice, informative selection of artifacts and information about Eljah Lovejoy, the truly courageous abolitionist newspaper editor who was continually attacked by angry mobs. Repeated attacks by drunken angry mobs in Alton, Illinois, had cost him 3 printing presses, until he was murdered defending a fourth one. Didn’t Alton host one of the Lincoln-Douglas debates? Brian, I am wearing a turquoise jacket, and will hang out in the convention center registration area around noon. Looking forward to it. There was one house in my home town that went completly nuts with Christmas decorations. The whole roof was covered in lights including a portrait of JFK and possibly Pope John rendered in bulbs. Music came out of somewhere and things revolved and blinked. You could find this house from any slightly higher ground within five miles by the glow it generated. Brian, it’s Nauvoo, and the Mormons are rebuilding the temple there, and it’s not alltogether welcome. LAMary, the suburb just north of me goes crazy with Christmas decorations – people rent buses and curise the place to check them out. One multi story house that faces a park has a christmas tree that starts in the living room and ends in the upper bedroom. The previous owners sold the house under the condition that the new owners had to put that tree up each year, and so far, they have. Their home dec­o­ra­tions make Clark Gris­wold look Amish. I bet that’s the real key as to why the author likes the person who the proprietress liked the least. If a person is as guileless as Clark Griswold, then she can score points for sentimental silliness, even if one shudders at the consequences of several million others acting on the same outlook. Like loving a particular pet mouse, while hating the thought of dozen of them gnawing within one’s walls! That house is DaBomb!! I’m still LMAO! I didn’t expect that music, thought it would be more sentimental and christmassy. >>Eljah Love­joy, the truly coura­geous abo­li­tion­ist news­pa­per edi­tor who was con­tin­u­ally attacked by angry mobs. Repeated attacks by drunken angry mobs in Alton, Illi­nois, had cost him 3 print­ing presses, until he was mur­dered defend­ing a fourth one. any of ’em named Beck? or Limbaugh? saw an interesting ad in a gun magazine this weekend… for a cap with “Infidel” across the front in large letters, both English and Arabic, and a US flag across the back. Copy was something about not putting up with Islamic terrorists… will see if I can find & post a link. Speaking of Holiday Lighting Engineers, there’s a house “near” Nancy (it’s in one of the Grosse Pointes), on the corner of Jefferson and Moross, that goes all out for Halloween and Christmas. I’m sure the lighting bill for their displays doubles their electric bill – their summer high electric bill! There’s another house or two along Jefferson where it skirts the Detroit River that also do these huge displays. I imagine they have to have a service come out and do the lights if only because they’re need a cherry-picker truck to string the lights that high in their trees. It’s a fun drive along Jefferson the couple weeks before Christmas looking at these light displays. Somewhere in Grand Junction, Colorado is “The House That Christmas Threw Up On”. At least, that’s what my extended family calls it. There are enough decorations for any 5 entire neighborhoods. I have always wondered just why people do that. Is the music in the second video played along w/ the lights in real life? Hard to imagine that the neighbors would tolerate that. Christmas is, apparently, not the only holiday that leads people to ridiculous excess. Here, it’s a Michigander rather than a Texan that has gone “all in”. Also came across this story about changing land use in Flint. A huge struggle, but some people are working hard to make things better in small ways. Jolene: When you visit the pumpkin house, book a room at the Stonewall Inn B&B just down the street and you can sit in on their Civil War Ghost Story evenings, last two weekends in October and first two in November. Then head up 22 just outside of town to visit a super-creepy cemetery. Frankfort’s a great summer town; sounds like it’s fun in fall, too. I always wonder where in the hell they store all of that crap the other 11 months of the year! Scout: I wonder about that too. The inflatable things especially have to take up a lot of space. There are families around here who have displays for every holiday. I’m particularly fond of the merging of secular and religious motifs at Christmas, especially the inflatable Thanksgiving turkey showing up for the nativity as a stand in for one of the beasts. There’s one family who has assemblages of life size statuary that must number in the hundreds. They’ve even got a Fourth of July display, as well as Memorial day and Halloween. I haven’t driven by the house on Arbor day or President’s day, but something tells me they’ve got that covered,too. Scout, they probably have a storage unit just for the holiday decorations. My humorless ex-pastor used to get incensed at having to stare at the huge inflatable Homer Simpson Santa Clause across the street from his house, November til January. Every year my neighbors put an inflatable moving holiday-character Merry-go-round on their postage-stamp-sized lawn. It lasts about two weeks before wind or ice takes it out. Two years ago we didn’t see it until spring because of the freaky snow year. They keep trying, though, bless their cheerful optimistic hearts. I’ve only read a few things about the UGRR — just enough to get an idea that the term refers more to an ill-defined cul­tural impulse, rather than a uni­fied, tan­gi­ble thing. Brian, I’ve been researching the UGRR heavily for years and it actually was tangible and unified — though very well hidden. I highly recommend the memoirs of Levi Coffin, if you want some idea of the magnitude of the effort. The Society of Friends didn’t have a Meeting in this corner of the state, but they had members dispersed around the area working in cahoots with Wesleyans, Universalists, Covenanter Presbyterians and certain other religious sects and organizations. John Brown may have been considered a dangerous sociopath by some, but he was a hero to others. Late to the Xmas party today (many, many Monday meetings) but thoroughly enjoying your take on “Tinsel,” Nance . . . So it’s not, then, a book like “Closing Time,” huh?! The video “Christmas Card from our house to yours” (oops, sorry, “Holiday card”) that local TV stations put together and air during seasonal station breaks . . . you know, the one with the staff, from sweater-clad on-air talent to behind-the-scenes cubicle peons, mugging for the candid KXYZ-TV cameras as The Ronettes’ version of “Frosty the Snowman” echoes and reverbs in the background . . . I can smell the mistletoe and reindeer already . . .
Reindeer, paddy o? That’s a pretty rancid smell if the miniature reindeer, that the xmas tree company displays next to our church every year is any indication. I always feel sorry for the little guy. Last year I decorated my fig tree when my xmas tree bit this dust. This year I may start from that. Alex, have you been down to the Rankin House on the Ohio? That was just a truly inspiring experience for me. The table and the lamp in the window looking over the valley, and the stairway down the bluff . . . history was quite tangible there. I could never understand why people put so much crap out during the holidays. It usually looks like they bought K-Mart out of everything they had. And remember. It all has to come back down. These people are nuts. Sue, Your neighbors are nice. At least you don’t have what I have had. You are lucky. I remember that Merry-go-round. That thing was awful. Had a great lunch with Brian,so nice to get to meet one of you in person! Perhaps it will be Dorothy at a quilt shop next! Or maybe someone was at Troyer’s Meat in Shipshe last Saturday and our paths crossed without even realizing. I have thought from the beginning of the web back in 95 or so, so that the truly amazing thing it does is makes communities happen in a new way. And here we are! Christmas makes me want to hurl into Santa’s toy sack. Because my heart it three sizes too small…. You guys are all making baby Jesus cry. There, happy now?! A buddy of mine at work likes to drive his teenage sons and their friends around to particularly ostentatious holiday displays. He stands lookout while the boys put Santa and Mrs Santa and the reindeer into compromising sexual positions. Regarding the Rankin House, I’ve yet to get there, but it’s on my short list of must-do roadtrips. His brother’s house in Fort Wayne was discovered only a few years ago. It had been covered in crappy siding and hemmed in by modernity and no one figured out what it was until somebody thought it needed to be torn down. Anyway, what’s remarkable about Alexander Rankin’s house is that it’s architecturally identical to his brother John’s in Ohio, although the setting isn’t as lovely. No one has figured out why the Rankins built brick homes with one side open and a wooden edifice attached. Did you go home already or are you hanging around for Day Two? That’s my parking garage where the conventioneers are all stashing their vehicles and I work in the vicinity. I might have tried to meet up with you yesterday but I was under the gun to get a project done. Also blew off a prepaid luncheon I was supposed to attend. But if you’re around today, I’d be delighted to meet you. Alex, John Brown may have had good intentions but his methods were murderous. His December 1858 raid into Vernon County, MO (in which he and his men liberated slaves, supplies, and gold) left bodies on the ground. I’m certainly not trying to defend slavery nor re-fight the war here, just pointing out John Brown was more than an orator. Nancy – FYI, Bullwinkle went to the Goodwill yesterday. Very sad. His antlers are all droopy and he looked pathetic. But one good memory of him – when Joey jumped out of his skin one night, walking through the dark house and thought he was a person standing in the entry hall. John, no denying what you’re saying is true, but if you’re organizing an insurrection some casualties are to be anticipated. John didn’t live to see the north subdue the south, nor did he anticipate that such a thing would ever happen. His methods certainly strike those of us sitting here in our house slippers sipping coffee as brutal and mad, but in the context of the times, when life was pretty doggone cheap, and he was willing to put his own on the line, it’s also possible to admire his courage. There’s also a tendency to praise MLK while channeling moral outrage at Malcolm X and Huey Newton, but I can’t blame the latter for not trusting that rainbows and butterflies were going to save the day. Alex, I am parking in that garage as well. I have a luncheon that is supposed to end around 12:30, I think it is in a Hilton ballroom right on the skyway level. You could catch me there, or go down the escalator and out the doors on your left and find me smoking outside immediately after. Today I am mostly turquoise and purple. Here’s hoping. Connie, let’s meet for a smoke in front of the Hilton at 12:30, maybe cup o’ joe. I’m yellow on top of pale green corduroy, black coat if it hasn’t warmed up by then. works for me Alex, Hilton front at 12:30. Pictures if you have the time. Hattie • Jeff (the mild-mannered one) • Connie • brian stouder • alex • Peter • coozledad • brian stouder • coozledad • brian stouder • Connie • brian stouder • LAMary • Peter • brian stouder • Pam • basset • beb • Little Bird • Jolene • Jolene • Sue • brian stouder • Scout • coozledad • Rana • Sue • alex • paddyo' • moe99 • Jeff (the mild-mannered one) • Holly • beb • Connie • crazycatlady • Danny • alex • John • Pam • alex • Connie • alex • Connie • Joe Kobiela • and YOU.